It is also suitable for children over 3 years of age. Herbal water, nature identical flavour of menthol, essential oil of wild oregano, mint, sage, thyme, and clover. Herba Sept solution does not contain alcohol, preserving agents, artificial colourants, sweeteners or gluten. Herba Sept may be turbid due to its natural ingredients. Prior to each application, thoroughly shake the Herba Sept solution. Use the Herba Sept solution to rinse the oral cavity and the throat 2-3 times a day after meals. It is suitable for children of over 3 years of age. 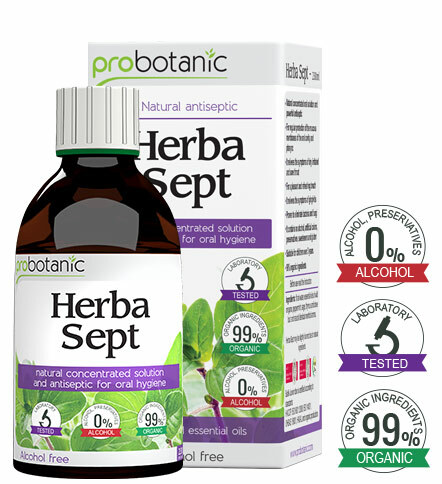 Herba Sept should be used within 6 months after it has been opened. Keep it in a dry and dark place, at room temperature. The lot number and the expiration date are indicated on the packaging. Herba Sept is intended for local application and may not be swallowed or drunk. The persons allergic to any of the ingredients should not use the preparation. Streptococcus pyogenes, Streptococcus mutans, Streptococcus salivarius, Streptococcus sanguis, Pseudomonas aeruginosa, Proteus mirabilis, Staphylococcus aureus and methicilin – resistant Staphylococcus aureus, Candida albicans and Candida krusei. Streptococcus pyogenes most often causes rhinitis and pharyngitis, Streptococcal pharyngitis, scarlet fever, inflammation of the respiratory organs, erysipelas, and suppurative skin infections. If a therapy is not timely initiated, complications may occur in the form of sinusitis, the middle ear inflammation, meningitis, and rheumatic fever. Streptococcus mutans is responsible for the occurrence of tooth decays, which will produce an ideal ground for the periodontal disease and gingivitis. In 30-40% of the cases, bacterial endocarditis or inflammation of the heart valves may occur as the most serious complication. Staphylococcus aureus is also called golden staphylococcus. This bacterial species is unique because of its numerous antibiotic resistance mechanisms. Namely, the bacterium has created numerous methods to protect itself from the effects of antibiotics, which creates problems in the treatment of the infections that it causes. Staphylococci most often give rise to the inflammation of the mucous membrane of the nose and throat, ears, sinuses and, as often as not, they also cause pneumonia. Through blood and lymph, they may cause secondary infections, such as osteomyelitis, arthritis, meningitis, and endocarditis, and the persons having reduced immune response are particularly susceptible to it. Oral candidiasis is a fungal infection of the oral cavity most often caused by Candida albicans, and it occurs when, under the impact of a local or systemic factor, normal flora of the oral cavity is disturbed. The symptoms of oral candidiasis are whitish coats on the tongue and in the oral cavity, bad breath, swollen lower lip, the taste of metal in the mouth, bleeding of the gums, sensitivity and pain in the mouth. At the Institute for Biological Research Siniša Stanković in Belgrade, the comparison between Herba Sept and the most commonly used commercial antibiotics was made that included: Ospamox, Pancef, Cephalexin, Streptomycin, Klacid, and the antimycotic Nystatin, whereby Herba sept, both in a low concentration and in different dilutions, has demonstrated its efficiency, i.e. it prevented the growth of bacteria and fungi without occurrence of resistance, while numerous antibiotics-antibitici used in the investigation have demonstrated inefficiency due to resistant species of microorganisms. Herba Sept is a natural alcohol-free product, which in its composition contains ethereal oils of wild oregano, thyme, sage, clover, and peppermint. Essential oils of wild oregano, thyme, and sage are deemed to be strong natural antibiotics, primarily due to their respective antimicrobial, anti-inflammatory, and antiseptic properties. Together with the antioxidant properties of clover oil and analgesic effect of peppermint oil, they are an ideal combination in the fight against bacteria and fungi that cause infections of the oral cavity, gums, and the pharynx.